Water displacer, lubricator and rust preventer in one can! Say good bye to PTFE sickness. This product was funded through Kickstarter, see our video, and the Kickstarter story here. Great for bike workshops, large and small. PTFE accumulates in the environment, and people's body tissue. Mechanics get the stuff on their hands. We've had bicycle mechanics call us who got sick from using lubricants from our toxic competitors. Things on your skin, especially oily based products seep in and can cause harm. 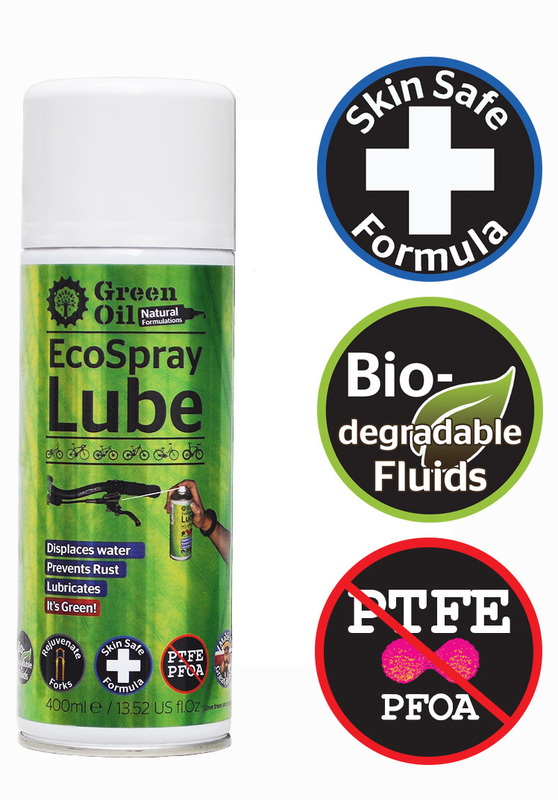 To help save people from cancer, dermatitis, and to protect the environment from the PTFE sprayed every day in bike workshops, we created the Green Oil EcoSpray Lube. Light lubrication, getting rid of water after cleaning your bike. Suspension forks - if they're old and worn out, and you can't be bothered to get them properly serviced, get some more life from them with EcoSpray Lube. Hard to reach bits - brake leavers, moving parts on dérailleurs, and more! Ideal if you want to stop a squeaky chain super fast in a rush. EcoSpray Lube is skin safe, so if you do get it on your skin, it won't make you ill. It's a natural, plant based formula. We used to make the CF3 Re-usable lube spray which was was great, but required the cap to be pumped up and down numerous times. Many people in bike workshops were not prepared to spend time doing this - they prefer the convenience and speed of an aerosol. Further, the company which made one of the essential parts for it stopped making it. So as the CF3 was phased out, we're phasing EcoSpray Lube in. How is Green Oil EcoSpray Lube green? Other spray lubes out there contain PTFE and petroleum. They don't even bother with proper recycling information! This is crazy, as every fluid used on a bike ends up in the environment, and usually on a mechanic's hands. And your hands, and in your garden. Most street drains lead to rivers too. The fluid content of Green Oil EcoLube Spray is 100% biodegradable. We don't use palm oil - all our ingredients are sustainable sourced. We use plant based ingredients, natural molecules with similar long chain molecules to those found in petrochemicals. The mixture used is sticky enough to stay on the chain, but not so sticky excess dirt sticks to it. The can is made from recyclable steel. In the future we'd love to use recycled steel. You can recycle the steel in your metal recycling bin. Take the plastic bits off first, put these in the landfill bin. If you're looking for a credible alternative to heavy duty PTFE based lubricant sprays, then the eco-spray delivers. In short, this spray lube is ideally placed to achieve that which i require without cutting a bigger hole in the ozone layer. And the finest recommendation I can offer is that it just works. Simply and brilliantly. Just what we've come to expect from green oil.